Make your fleet more efficient and versatile by adding quick-change cargo systems to your aircraft. 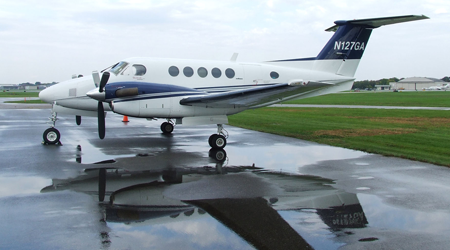 With our innovative technology, you can transform your King Air™ passenger aircraft into a cargo carrier, and back, in just a few minutes. We make great aircraft even better. Our aerospace engineers specialize in modifying aircraft so that they deliver better value to your company. We also obtain all required certificates and approvals from the FAA, including STCs and PMAs. Aerospace Resources, Inc is an aerospace engineering firm that serves aircraft operators all over the world. We offer full-service structural and electrical systems design, engineering, and manufacturing. Our founder has more than 30 years of experience in the aviation industry and has flown freight, charter, and medical aircraft for a variety of operators, including TWA™. He has also been an instructor and a company check airman. Over the course of his career he worked with many pieces of equipment that were clearly designed by people who had never had to use their own products. Aerospace Resources, Inc is different. As experienced aviators, we develop practical solutions that have been tried and tested in real-world settings. Our engineers have logged more than 10,000 flight hours, so they understand the needs of aircraft operators.